Free download Image Analyzer latest version. 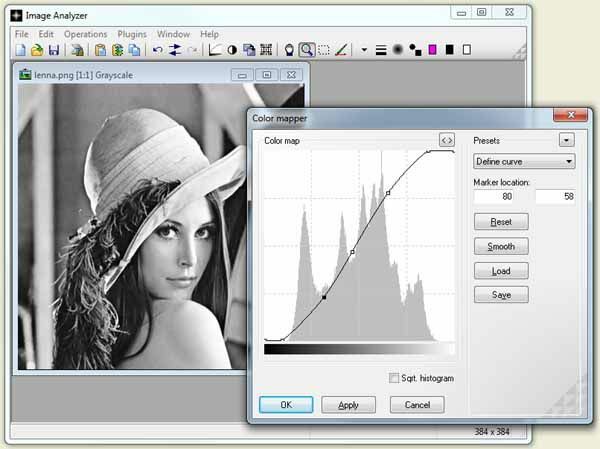 Image Analyzer is an image editing and analysis tool. This app supports MP, CRU, JPEG2000, PNG and PCX for read or write and PNM, RAS, PPM, PGM and HIPS for reading. Image Analyzer allows the users to resize and copy their image and also apply filters and perform advanced conversions and transformations. The users can use this program to view and edit image files. The users will find that the interface of this tool is plain and easy to navigate through. In this app the pictures can be opened via the file browser only, since the drag and drop method is not supported. Then users can configure file format options like transparent color key, quality and file size and compression level. But they can also create image from selection, create mask selection from color similarity and automatically grow or shrink a selection. The users can perform various operations in addition like crop, resize, flip, deskew, rotate, mirror, repeat and wrap. The users have also the option that they can modify saturation and vibrancy, remove the red eye effect, increase the local contrast, color balance and curves, as well as import and edit a palette. Furthermore, they can apply several image effects which include smooth, quantize, blur, white noise, adaptive noise reduction, gray scale, texture synthesis and skeleton. Through this app the users can set the image gamma and red eye removal threshold, make file associations, change the interface language, uses the undo, redo, copy and paste functions and others.